Que acelera dos 0 aos 100 km/h em escassos 3,9 segundos, já se sabia. Agora, a «alVolante», citando fontes da Alfa Romeo, avança que o Giulia Quadriofoglio Verde deverá atingir os 321 km/h. A versão mais desportiva da berlina de tração traseira, de resto, a única que foi até ao momento apresentada, está munida de um motor 3.0 de seis cilindros biturbo com 510cv. A Alfa Romeo adiantou ainda uma relação peso/potência de 3 kg por cavalo, melhor que os 3,7 kg anunciados pela BMW para o atual M3. Como seria de esperar a nova “bomba” de Arese já ultrapassou o desafio para todos os desportivos que se prezem, Nurburgring, mais conhecido como «Inferno Verde». 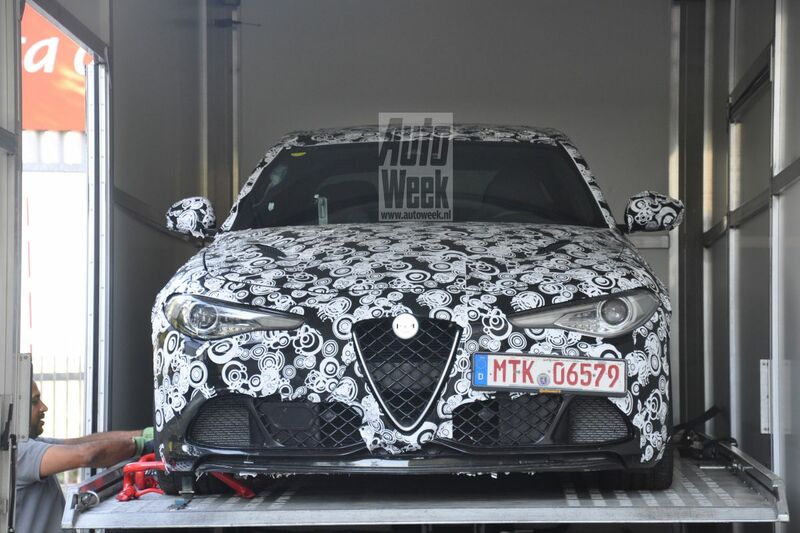 O Alfa Romeo Giulia Quadrifoglio Verde já tem tempo de referência não oficial em Nurburgring. O protótipo de testes terá completado uma volta ao «Inferno Verde», com 20,8 km, 150 curvas, em 7min.43s. A confirmar-se este registo, que está a ser avançado pela imprensa italiana, o bólide terá tirado nada menos que 9 segundos ao tempo de BMW M4, que registou 7min.52seg. A versão mais desportiva do Giulia, de resto, a única que foi até ao momento apresentada, está munida de um motor 3.0 de seis cilindros biturbo com 510cv. O motor, de origem Ferrari, promete mais de 300 km/h de velocidade máxima (fala-se em 321 km/h) e uma aceleração dos 0 aos 100 km/h em 3,9 segundos. A comercialização está marcada para a primavera de 2016. No Salão de Frankfurt, em meados de setembro, serão revelados mais detalhes da gama Giulia. A Alfa Romeo divulgou um vídeo onde se podem ver alguns detalhes do Giulia Quadrifoglio Verde, a versão desportiva da berlina de tração traseira do sucessor do 159. Com o título “Desenhado com Paixão”, o vídeo explica alguns detalhes estéticos do Giulia e mostra pela primeira vez, pelo menos de forma oficial, o interior. É possível ver detalhes como o botão da ignição, em vermelho, integrado no volante, e o comando rotativo do sistema “Alfa DNA”, na consola, com diferentes modos de condução. O botão de ignição destina-se a dar vida ao V6 3.0 biturbo de 510cv, que permitirá atingir uma velocidade máxima de 321 km/h e de acelerar dos 0 aos 100 km/h em 3,9 segundos. A berlina de tração traseira tem estreia oficial marcada para o próximo dia 15 de setembro, no arranque do Salão de Frankfurt, na Alemanha. O lançamento está marcado para 2016. É oficial: o Giulia Quadrifoglio Verde é a berlina mais rápida em Nurburgring, com 7m39,0. O tempo foi anunciado pela própria Alfa Romeo e deixa o BMW M4 a 13 segundos (7m52). A Alfa Romeo confirmou, de resto, que o Giulia Quadrifoglio Verde é capaz de alcançar os 307 km/h de velocidade máxima, número aquém dos rumores, que apontavam para algo como 321 km/h. O motor, recorde-se, é um 3.0 de seis cilindros biturbo de origem Ferrari com 510cv e 600 Nm de binário. A aceleração dos 0 aos 100 km/h é cumprida em apenas 3,9 segundos. O desempenho dinâmico é ainda valorizado por uma distribuição de pesos 50/50 entre os dois eixos e várias ajudas à condução, como sistema de vetorização de binário e gestão de carga aerodinâmica. O Giulia Quadrigoglio Verde estará disponível em Itália no último trimestre do ano, a partir de 79 mil euros. Em Portugal deverá custar o mesmo que um M3, ou seja, pouco menos de 100 mil euros. Muita dor. Necessita de um coração desportivo. Não engoliu um sapo verde, engoliu um trevo com quatro folhas verdíssimas. Everything sounds better in Italian. ‘Ho bisogno di svuotare la mia fossa biologica’ sounds like poetry, but it actually means ‘I need to empty my septic tank’. Say ‘Dov’è il negozio di scarpe’ and you sound like you’re ordering a pizza in a fancy restaurant, when in fact you’re asking directions to the nearest shoe shop. And ‘Squadra Puzzola’ might sound like a new Formula 1 team, but it’s actually an approximation of ‘Skunk Works’. Which is a pretty ugly name in English, though it’s a cool concept: don’t we all want our cars to be hot-rodded by a ‘skunk works’? A small team of dedicated developers, working in top secret, all black-ops and underground? Ken Block probably has a skunk works building his next drift car right now; Toyota is not using a skunk works for the next Auris. The name originates from the US aerospace company, Lockheed Martin. During the latter years of World War II, the US Military urgently needed a new fighter plane, to counter the rise of the Nazi jet planes. Realising it would take years to push a new design through the usual channels, it asked Lockheed to ignore the rules and conventions of military procurement, and just get it done. Lockheed put a young engineer called Kelly Johnson in charge of a small, hand-picked team, and gave him 150 days to deliver a new aircraft. Because the factories were all flat-out with the war effort, Johnson’s team was housed in a former circus tent, round the back of a manufacturing plant. The tent smelled bad, and the top secret project became known as the ‘Skunk Works’. Johnson delivered the XP-80 Shooting Star in just 143 days – it was America’s first jet fighter. Cool story. Now hold everything you’ve just read in your head, and think about Alfa Romeo. Of course, it’s perfect isn’t it? A once-great sporting brand, locked in a gigantic corporation, stifled by the bureaucracy, the platform sharing, the economies of scale, the god-awful front-wheel drive… Alfa Romeo has been needing to think outside the usual channels for a generation; to ignore the committees and accountants and the Fiat Doblo parts bin, and create its own XP-80 Shooting Star. Trouble is, this kind of thing never happens within a big corporation – you need to be a TVR or an Ariel to take risks like that. But this time – miraculously! – the CEO of Fiat Chrysler Automobiles (FCA), Sergio Marchionne, did exactly that, and you’re looking at the result. It’s an incredible story. If this car is anywhere near as good to drive as it looks, the new Alfa Giulia will go down in history… and the Squadra Puzzola will become legend. Lorenzo Ramaciotti strolls into the huge white room, looking relaxed and cheerful. We’re inside Fiat’s sprawling Mirafiori factory in Turin, visiting the Centro Stile design studios for a first, close-up look at the new Alfa Romeo Giulia. And when I say ‘first’, I mean ‘world first’ – after its unveiling in Frankfurt, CAR is the first magazine anywhere in the world to enjoy a private one-to-one with the car. And now Ramaciotti’s popped in for a chat. This man is one of the most significant designers of the last 40 years, yet he’s never been a celebrity stylist. He’s like your favourite uncle – gentle, self-effacing, with a warm twinkle in his eye. Incredible to think, as I talk to him, that ‘Uncle Lorenzo’ here joined Pininfarina in 1973, rose to be the head of that most famous of design studios, and was responsible for cars such as the Ferrari 456, the 550 and the Enzo, plus the Peugeot 406 Coupe and the gorgeous Maserati Birdcage concept from 2005. The Birdcage was one of Ramaciotti’s last projects before he stepped down (buying a Ferrari 430 as a retirement gift to himself). He probably thought he was going to take it easy, do some gardening and write his memoirs, but then in 2007 Sergio Marchionne called him and asked him to oversee the designs of FCA’s growing portfolio of brands – Fiat, Ferrari, Maserati, Alfa Romeo, Lancia, Dodge, Chrysler and Jeep. So Ramaciotti came back, and (amongst other things) managed the team that did the Maserati Alfieri concept and the Alfa 4C, before retiring again. But this second retirement is still a working retirement – he hands me his business card which says ‘Special Advisor to the CEO’. Wow, this guy really doesn’t know how to stop. So does that mean he’s still hands on, I ask? Does he still draw, for example? (I’m itching to hand him my notebook and pen for a signed sketch, which I can then frame and keep forever until I sell it on eBay). ‘No, I don’t draw any longer,’ he says, smiling (I try to hide my emoji sad face). ‘My skills are more in… direction,’ he explains carefully. ‘In decision making. And the tutoring of people with me’. And talking – Ramaciotti is very good at talking. ‘I am “Chief Designer Emeritus”, like the Pope,’ he adds, chuckling. ‘But I still like to speak about cars and car design’. So the Squadra Puzzola was born, in secret, and at its head – my god, I can’t believe I’m writing this, it’s like a script out of a car enthusiast’s action movie – is none other than Philippe Krief, the Ferrari chassis engineer responsible for the Ferrari 458 Speciale. I feel I need to add a few exclamation marks in now, just for effect: !!!!!!!! Krief is told to assemble a crack squad of just ten people, to hide in a secret location and create the perfect Alfa sports saloon for the 21st century. 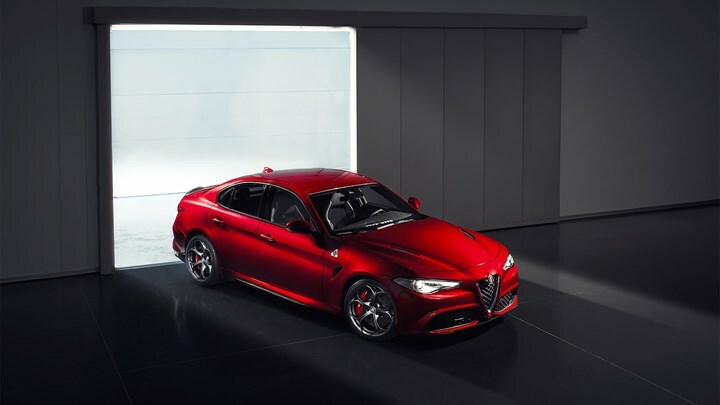 Talking to CAR as Giulia was first unveiled back in June, Krief described the process: ‘I called them one by one, like Mission Impossible: you choose your guy, you call – okay, they come! I called one guy in Australia, who had worked with me and quit the company. Three years later he’s working in Australia for another car maker, I call him and say, “What do you think?” And he says “I’m your man”’. Soon, this special Ferrari-inspired team assembles in Italy to discuss their bank heist – sorry, engineering project; they’re given a blank sheet of paper and told to develop the perfect Alfa,and ex-Pininfarina chief Lorenzo Ramaciotti is in charge of the styling. Cue the theme music to The A Team and get me Hollywood on the phone. Two and a half years later, we’re in a big empty room in Turin, enjoying the product of the Squadra’s work. And I can tell you, it looks incredible, as soon as you see it: low, wide, muscular and purposeful. This is a brand new platform from the ground up, and that all-important, rear-wheel-drive configuration is hard-baked into the design: the front wheels are pushed forwards, the wheelbase stretched back (it’s the longest wheelbase in its class, apparently), and the whole thing appears to be swept back on its haunches, like a hill-top tree that’s been shaped by the wind. The stance, the proportions – it just looks instinctively ‘right’ as soon as you clap your eyes on it. Blessed with this dream scenario, Ramaciotti’s team did not disappoint. The Giulia is a handsome car, lean but pumped up, bulging like a bodybuilder’s biceps. It’s curvaceous too, and apart from the scoop down the flanks, there isn’t any really defining line on the car. ‘It’s a car you must see in the flesh,’ Ramaciotti agrees. ‘It’s very three-dimensional, it doesn’t have a main character line on which the light can play – you have to understand the curvature of the surfaces on the real thing. Italian design is about simplicity and purity,’ he goes on. ‘It’s not a matter of how many lines you draw, the sculpture of the surface should speak by itself. The surfaces must be richly developed in a way that shines under the light’. That rear three-quarter also shows off the rear haunches and the dragster-fat rear tyres. 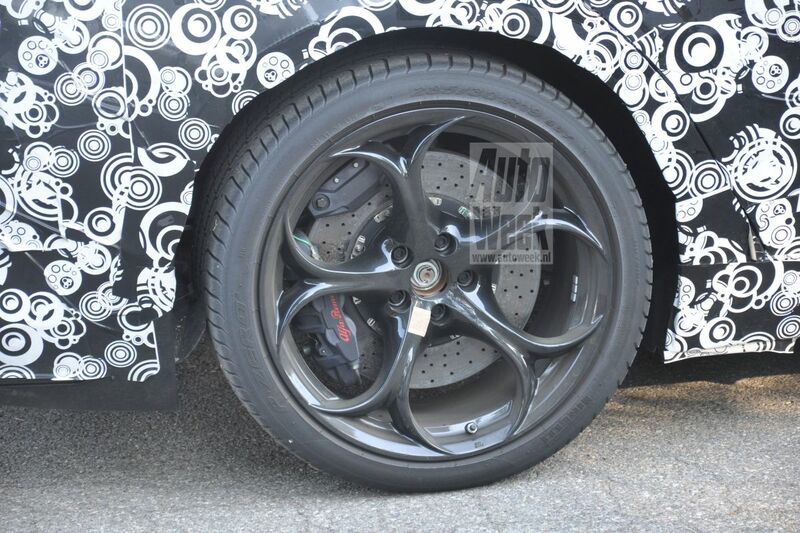 This ‘Quadrifoglio’ example – the unofficial ‘launch spec’ – sits on standard 19-inch rims, and there will be no 22-inch option. The design was conceived around these wheels, the arches were cut for them, and they look perfect. We move round to the front and I tentatively suggest the headlights are the most disappointing aspect of the car. They look generic – there’s a little bit of BMW in there, a bit of Jaguar… I loved the old 159’s triple hooded lights, which looked so distinctive and menacing – why not keep those? We talk about the vents in the bonnet (all the vents are working) and then take a look at the engine. The underside of the bonnet is bare carbon – another reminder that this is a serious performance car – and beneath it is the new, all-aluminium 2.9-litre twin-turbo V6. Putting out 503bhp, the Giulia Quadrofoglio has a top speed of 191mph and a 0-62 time of just 3.9 seconds. And now I’m feeling I CANNOT WAIT TO DRIVE THIS CAR. So, a carbon bonnet, carbon roof and a trick carbon propshaft, and doors and wings made of aluminium. I climb inside and find (optional) carbon-backed race seats. I settle into the hip-hugging driver’s seat and adjust the thick-rimmed steering wheel. Inside, the elegant simplicity continues – apart from the Ferrari-inspired starter button on the wheel, it’s all black in here, with subtle brushed aluminium details. ‘Simplicity does not have to mean it is poor,’ Ramaciotti explains. ‘It should be simple but fulfilling.’ Yes master, I understand now – Ramaciotti is fast becoming my Yoda. And the steering – which our ex-458 Speciale man Krief promises is razor sharp and full of feel – is just two turns lock-to-lock. Everything, everything, EVERYTHING – every little detail is just right, and full of promise. It all speaks volumes about a car that was designed by a small team, and not a big committee. Take the rear number plate – not a striking detail to you and me, but to the Squadra Puzolla, they sweated it over its location. ‘Since 20 years, Alfa has the licence plate on the rear bumper,’ says Ramaciotti. ‘But the Giulia team wanted the car to be as compact as possible. To have the licence plate in the bumper makes the car longer, because of the packaging for everything in the bumper area. So to keep the car as short as possible, we had to raise the licence plate to the hood. For us, this was a radical decision,’ he says with emphasis. Really? It’s a glimpse into a world that struggled to reinvent Alfa for all those years – if moving a number plate north by a few inches caused such consternation, no wonder the committees and vested interests couldn’t re-invent the brand. And what a brand – Alfa Romeo won Le Mans four times in the 1930s; it won the Formula 1 World Championship twice in 1950 and ’51; and it won the World Sportscar Championship twice in the 1970s. Marchionne’s plan was to ‘shake the structure of Alfa’, as Ramaciotti puts it, and bring back some of that glory. The result – the engine, the drive, the interior, all those little details – feels like a ‘thoroughbred’. An old-fashioned word, perhaps, but a fitting one for this car and that historic, evocative badge. It has to be great to drive. Dear god, please. For all sorts of reasons, and with all sorts of meanings, it just has to be great to drive. ‘The V6 is a ground-up build,’ says project leader Philippe Krief. ‘Twin-turbo, 90-degree. What was important for us was the feeling, it’s not necessarily the amount of torque. When you accelerate, you can have all the torque suddenly then nothing, or you can have torque which is increasing, increasing, increasing: we tuned it to have this feeling.’ The launch car has a manual six-speed ’box, but a bespoke seven-speed dual-clutch unit is coming soon. ‘Doing a car in two years is not possible – you ask any car maker,’ says Krief. ‘The standard says four. Marchionne said the only way is to be completely outside of the world, and try to think differently.’ Krief recruited his ten men, who worked collaboratively in an ‘open space’, with Marchionne dropping in once a month. The total Giulia team is 600 strong, which is about 20% of the numbers Fiat would deploy. ‘No negative voices – we just had to do it,’ says Krief. Giulia is designed with ‘natural downforce’ – a product of design, proportions and a wide track. The rear spoiler is fixed but active aero is deployed via the front splitter by what Alfa calls Chassis Domain Control. ‘There are two electric actuators linked to the brain that understand if you’re in a curve or a straight line, in an understeer or oversteer situation, and in respect of that decide to move the splitter,’ says Krief. Electronic dampers and a multi-link axle improve stability. This one-off racer didn’t win the 1938 Le Mans as intended, but with its streamlined body by Touring it’s one of the crown jewels of the Alfa Museum. ‘Clean, simple, beautiful,’ says Ramaciotti. This one-off prototype – now in a private collection in Japan – was designed by a young Giorgetto Giugiaro while he was at Bertone. ‘He is a master at surfacing,’ says Ramaciotti. Built by Zagato in 1965, the low-drag TZ2 is a candidate for the most beautiful car ever. Tellingly, Ramaciotti actually owns an example of the TZ2’s smaller cousin – a 1956 Abarth Zagato 750 ‘double bubble’. Compact SUV (2017): No codename yet: does that indicate Giulia platform can’t shrink to fit planned X1 rival? Giulietta Mk2 (2019): Planned as a rwd hatch, it could switch to front-drive. A replacement Mito, based on the next 500X, may follow. Página criada em 0.198 segundos com 22 procedimentos.